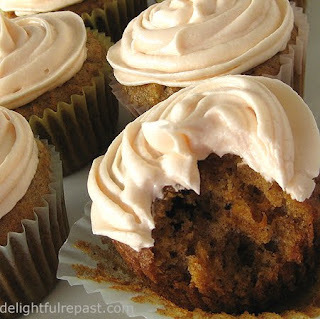 Carrot cupcakes came to mind when I was thinking of two upcoming special occasions. Number One - drum roll, please - this week is my first blogiversary! It was one year ago yesterday that I started Delightful Repast. It's been quite a year! You can help me celebrate by following Delightful Repast and telling your friends about it! What is the other occasion? If you’re looking for an excuse to have one last winter party, the 83rd annual Academy Awards will air on Sunday, February 27. If you want to get at all fancy about it, mail invitations right away asking guests to RSVP by February 18. You can work the Oscar theme, if you like, but the main thing is the food. Start with a variety of hot and cold hors d’oeuvres, allowing 6 pieces per person. Some ideas: Boursin cheese-stuffed snow peas, curried chicken salad in phyllo cups, pâte à choux cheese puffs, phyllo-wrapped asparagus rolls. Or just set out some pâté and dips, like hummus or baba ghanoush. Have one buffet of nibbles to be replenished throughout the evening and another of “real” food to be set out from 6 to 8 o’clock. Make it “lap food” that requires nothing more than a fork. Display desserts from 7 o’clock to the end of the party. In honor of my Oscar picks, I might make my individual trifles, which are quite elegant. Going along with the idea of individual desserts, maybe I'll make some cupcakes as well. Carrot, I think. Chocolate was my favorite flavor of cake until the day I had carrot cake with cream cheese frosting. I was a teenager, and it was love at first bite. My mother and I couldn't find a recipe for it anywhere, so we made one up. And here it is, with a few minor changes for cupcakes. For cupcakes, I use more finely shredded carrots, more finely chopped nuts, and tiny Zante currants instead of raisins. This is quite a light textured carrot cake, not at all heavy and dense as so many are. Do leave a comment. It's easy to do. Then, if you make the recipe, be sure to come back and leave another comment. I'd love to hear how they turned out. 1 Preheat oven to 350 degrees. Put 2½-inch paper bake cups in two standard muffin tins. In small bowl, whisk together flour, soda, cinnamon and salt. In another small bowl, stir a tablespoon of flour mixture into chopped nuts and currants to coat and separate. 2 In large bowl, beat eggs; beat in sugar, then oil. Beat in flour mixture. Stir in carrots, raisins and nuts. 3 Using a 1/4-cup measure, fill the bake cups with a scant 1/4 cup of batter. Bake at 350 degrees for about 24 minutes or until they are golden and test done with a toothpick. 4 Immediately remove from pans and cool on wire rack for an hour. They must be thoroughly cool before frosting. 5 In bowl of stand mixer, or with a hand mixer, cream together the cream cheese, butter, vanilla extract and salt. 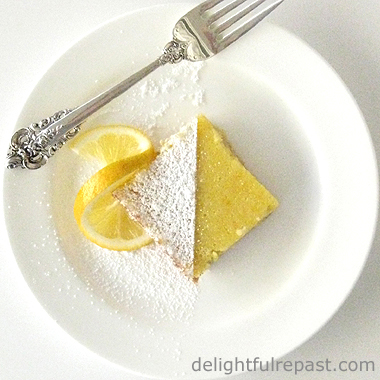 Gradually add powdered sugar (no need to sift) and mix until thoroughly combined, adding milk at the end. With a pastry bag fitted with a 2D (sometimes I use a 1M) tip, pipe frosting on cupcakes in a classic swirl. Ah that sounds positively scrumptious. Just imagining it, it tastes good!!!!!! Thank you, Tony! And it goes soooo well with a cup of tea. Mmm ... think I'll pull one out of the freezer right now so it will be thawed by the time I'm ready for elevenses! Joanna, thank you so much! Can't believe it's been a year! Oh, yes...yes, it is. Shriveling. I'm going out eat snow now. But HAPPY BLOGIVERSARY! Ah Jean, you are such a temptress!!!!!! Actually I'm enjoying a nice cup of tea at this moment. There truly is something magical about a good carrot cake with cream cheese frosting. I'm sure it's the cream cheese, but still, that moist, delicious cake!!! Mmmmmmm!!! I would love one of those right now! Thanks, Jenn! I'll celebrate with one of these and a cup of tea in just a little while. Thank you, Mary. I do plan to keep blogging for years to come. That's why I post only once a week (on Fridays)--it's a pace I think I can sustain indefinitely. Jean: these cupcakes look amazing! Especially the frosting. I'm going to try to make these soon. I will let you know how they turn out. Madison, thanks! I see a lot of cream cheese frosting recipes that call for waaaaayy too much cream cheese. My recipe has just enough to give you the tangy cream cheese flavor without it completely overpowering the cupcake. I can leave just about any cake alone...except for a good, moist and dense carrot cake with cream cheese frosting! Nothing better. This looks great. My frosting never looks as pretty as yours. Thank you, Judy! If you follow my recipe precisely, your frosting will look just as pretty! You can't add too much liquid if you want to pipe it. That's the key. Oh Yum! You frost your cupcakes so beautifully and I have no doubt they are delicious. Happy Blogoversary to you. I hope to follow your journey for many years to come. We'll have to see if we can inspire or cajole him to try these wonderful cupcakes???!!! Oh, YUM! Delish - carrot cake with raisins is my favorite! Thank you! Yes, I plan to be blogging for a long time to come. The Oscars? I expect lots of them to go to those involved in The King's Speech. Thank you! Grant, if you can only make one of my recipes together, do make it one that stands a chance with Sully's finickiness! Brenda, thanks so much for stopping by Delightful Repast! I have had cream cheese frosting on the brain for weeks now! These look absolutely delicious. Thanks, Meghan! Isn't cream cheese wonderful! And it's so versatile. Thank you! It's my favorite. One can actually feel "healthy" about eating a dessert with vegetables in it! We love carrot cake in this house and the cupcakes look fabulous. Beth, thank you! Wish I had one right now. Must make another batch soon. Carrot cake and cheese frosting...that's a classic and delicious combination! Angie, thanks. Yes, there's usually a delicious reason for a certain combination becoming a "classic"! does it matter if i omit the currants and nuts? will this change the proportion of the other ingredients? Leaving out the currants and nuts is fine and doesn't call for any other changes. You'll just have fewer cupcakes, perhaps 18 instead of 24.
would adding sour cream help? if so, how much should i add? Hmm ... I can't think why they would have come out a little dry, if you used the precise measures of everything. Wonder if your oven is a little hotter than mine? Then you could try taking a few minutes off the baking time. I wouldn't add sour cream. Perhaps an extra couple of tablespoons of oil, but not more than an extra 1/4 cup. Try that and let me know!